Deacon Claybourne has had a heck of a time so far on season 2 of "Nashville" as he navigated fatherhood for the first time, started drinking again and learned his lawyer girlfriend had cheated on him. Needless to say, it hasn't been easy for the recovering alcoholic to stay on the straight and arrow. 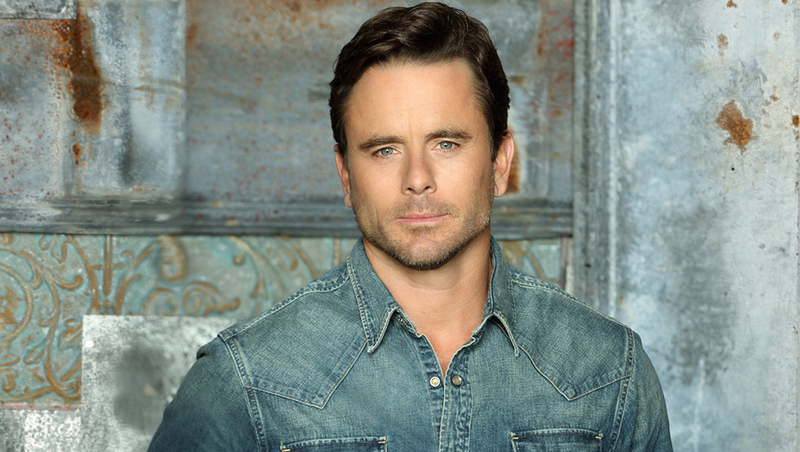 "All he ever wanted was that simple family life and it was sort of taken from him by his own demons that he's dealt with for all these years," said actor Chip Esten, who plays Deacon on the ABC series. "Deacon's always been a guy that's battled with those demons and has always tried to be a better man. But when you bring a child into the picture it makes that all the more difficult." Deacon is learning how to be a parent and supporter to Maddie Conrad (Lennon Stella), his daughter with ex-girlfriend Rayna James (Connie Britton). Rayna decided early on that Deacon wasn't in a good place to be a dad to her first daughter and decided to marry another man -- Teddy Conrad (Eric Close). She only recently told Deacon that Maddie was his. But Deacon and Maddie, now a teenager, have started bonding over music and finding ways to fit in to each other's lives. Connie Britton: Expect a twist at season's end of "Nashville"
"Now he has someone has he's trying to be a better man for -- not just Rayna but this daughter," Esten continued. "He knows she's going to be around, is going to see him and the steps he makes. And I can relate to that so completely -- that fight that he always has between the man he wants to be and the man that he turns outs to be. He's always just fighting for that." "It makes it more the meaningful even in terms of the show's story line," Esten said about his new father role. "And my goodness, getting to act with Lennon and Maisy (Lennon's on and off-camera sister) Stella -- these two unbelievable young ladies. They're so musically gifted. And now we're getting to find out how gifted they are as actors, too. They're been some great scenes that I love doing with her." With only two episodes left (the finale airs May 14), there's bound to be more drama on the series. "It's a good end of the season. It's really strong," he said. First lady Michelle Obama appears on the May 7 episode, and Britton tells CBS News to expect a few twists. Meanwhile, the cast members are still awaiting official word on if the show will get picked for a third season. "It's a hard wait but we're all cautiously optimistic...We know that we've done all we can," said Esten. "Everyone on the show brings a whole lot of love and passion and focus. There's nobody cashing a check here. Everybody is deeply invested." If the show does get picked up, the former "Whose Line is it Anyway?" star wouldn't mind getting a chance to perform one of his original songs on the series. "I haven't gotten a song on the show yet. I've been a songwriter for a long time now, and oddly country was my genre," said Esten. But he's not complaining. "The best songwriters in Nashville bring us these amazing songs...And some of them are well-known like Lee Brice, who's such a big name in music right now." Brice co-wrote the first song Esten ever sang on "Nashville" and also composed the track Deacon will perform during the season 2 finale. Esten, who grew up in Virginia and attended the College of William and Mary, was involved in music long before he joined the cast of "Nashville" in 2012. "In college I was in a band and I played music more than I did any acting," said the 48-year-old actor. "We were always out of town every week up and down the east coast at college, so I wasn't able to take part in any of the plays or musicals there. So when I finally went out to L.A. -- one of the earliest jobs I got was I played Buddy Holly in the live musical 'Buddy' so I was up onstage with a Stratocaster singing live...Now it's been almost 25 years since I started doing that. Almost like a bookend to that wonderful experience is this unbelievable show. It's very exciting, especially after all these years." Esten will be putting his musical talent to good use this week. On Wednesday, he's performing a show at Union Station in Washington D.C. as part of a three-day Capitol Hill event hosted by the Leukemia & Lymphoma Society. The goal? To raise awareness about the organization's mission to find cures for blood cancers, particularly for children. Esten is expected to sing about a few songs from "Nashville," along with a couple of original tunes. The organization is a very important one for Esten. His daughter Addie, now 14, was diagnosed with leukemia when she was 2-and-a-half years old, and Esten can remember practically every detail about the day he and his wife found out about the diagnosis. "They ran a raft of tests and said it could be a handful of things," said Esten. "We're all playing and the TV's on and they're coloring," he recalled. "The doctor came in and she said, 'Can I speak with you a second?' And she brought me out to the hallway. I've been doing this [acting] a while, and there's a whole lot of scenes, and one of the most dramatic scenes is when a parent is told something like this...What I was struck by is --- she did it very well. She didn't beat around the bush. She said, 'It is leukemia.' And in the very next breath, she said, 'And here's what we're doing to do.' It doesn't leave you hopeless even for a second. She started talking about the hope and things that can be done...That hope is because of fundraising and research." That's why the father-of-three has been involved with the organization for so many years. He attends events and helps raise funds and awareness for the cause. He even once did a stint on "Who Wants to be a Millionaire" so he could donate his winnings to research. "I didn't really want to go on. I didn't want to look like a fool on national TV," Esten admitted. "But they said no matter what happened I would be able to walk away with $10,000 for the local chapter...Who am I to say no?" It's a good thing he said yes; Esten walked away with $500,000 for the cause. These days, Addie is doing great, says Esten. "She's so wonderful and she's so strong...There's just something about her. She's astonishing to us. Every little thing is special in terms of where she's come from and what she's gone through," he said. And going through that process changed Esten's outlook on life and his career. "I was very happy with the life and career I had. I was very content with it, especially after going through what we went through with Addie," he said. "Your perspective changes. The things that I thought were so important -- whether it was fame or this or that -- they sort of fell away. And I realized how blessed I was." His success on "Nashville" is just the icing on the cake, apparently. "I feel so lucky for anything I had and anything else would be gravy," he said. "I remember saying, 'Don't get me wrong -- I love gravy.' So it makes sense that I'm in Nashville that I'm getting all the gravy...I'm a happy camper and very very lucky to be a part of all of this."